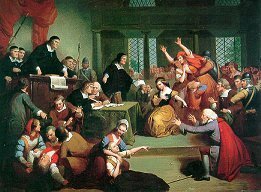 We the Honorable Judges, John Hathorne and Samuel Sewall, find the afflicted, Elizabeth Parris, guilty as charged of the charges of witchcraft. She is found guilty on the basis of many findings throughout the recent months. First and foremost, she disagrees with many of her father’s teaching and he is the preacher of the town! (said with enthusiasm) There also is irrefutable evidence of her using a "venus glass" to see the future, which she blamed her use of it on her "economic uncertainties" even though she is only nine years old, is surely the work Satan himself. No regular nine year-old girl should be this concerned with her economy and future. Other signs of her separation with the Lord and her new found friendship with the Devil are when she begins to forget errands and seems to be uninterested in what others had to say or do. She often cried out in church and cringed at the mention of God, Jesus, or the Holy Spirit. It has even been reported that she spoke in tongues! After long debate, it is with our deepest sympathies that we find Elizabeth Parris guilty of witchery and sentence her to death by hanging. May God have mercy on your soul.